The Bruce Lee grave memorial. Where is the Bruce Lee grave located? 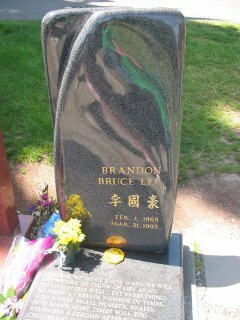 The first time I heard the Bruce Lee grave was in Seattle was when I was visiting with my parents before getting married. I had grown up idolizing Bruce Lee ever since I was a kid. I even had the bruises all over my body from trying to learn how to use some wooden nunchucks I got for my birthday. I mean, hey, I was excited about getting married, but Bruce Lee's grave! How awesome is that? It's one of the coolest places to visit in Seattle and if you go on a nice day, there is a spectacular view. Some people don't realize that Bruce Lee isn't the only one buried there. 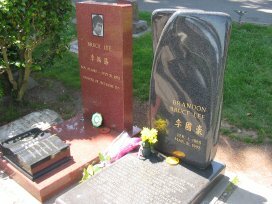 Bruce Lee is actually buried right next to his son, Brandon, who you might remember was killed during the taping of the movie, The Crow. Their grave sites are laid side by side with a small bench facing the graves. 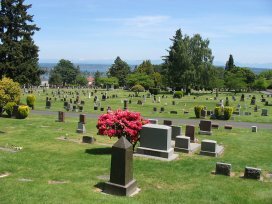 Every time I have been there to visit, someone else is there paying their respects, and it is by far the most visited site in the cemetery. Supposedly the grass where Bruce Lee is buried has to be replaced every four months because it gets so many visitors. People are always leaving behind tributes and it is a nice place to sit and reflect under a shade tree nearby. The view from the Bruce Lee grave site is spectacular and you'll want to be sure and get a picture of it. When you enter the cemetery, go up the hill and past the flagpole on the left. The graves are just northeast of the flagpole and I'm sure you'll probably see at least one other car parked nearby. Have A Great Story About Bruce Lee? Do you have a great story about Bruce or Brandon? Share it! Back from The Bruce Lee Grave.